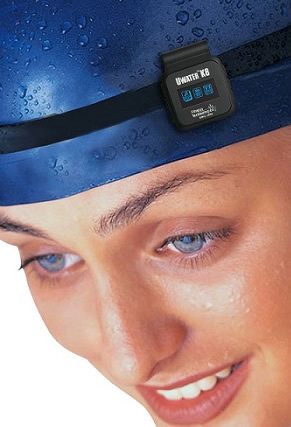 The UWaterK8 is pretty cool 8 gigabyte micro sized waterproof MP3 radio player that you can clip onto your goggles, headband or armband for swimming. The UWaterK8 has a 2000 song or 20 audio book storage capacity with a continuous play time of 8 hours on a single charge of its battery. You can actually create personal playlists of up to 2400 songs or 20 audio books within a choice of 99 sub-directories. Alongside the 8GB MP3 player the UWaterK8 has a digital FM tuner with superb worldwide reception both indoors & outdoors. 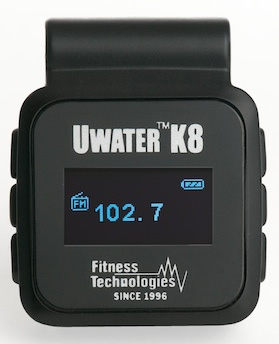 The UWaterK8 has a FM digital radio with a FM 88 to 108MHz auto tuning range. The UWaterK8 has a special format function specifically for audio books and comes with a high resolution 27mm OLED display for easy navigation. The uniquely engineered double-molded PVC case, soft touch TPL controls, stainless steel back plate (adopted from Swiss watch makers) are all 100% waterproof. Ergonomically-designed extra-soft ear tips seal the water out but keep the stereo sound in. 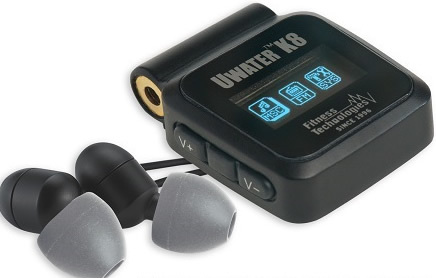 The UWaterK8 comes with waterproof neodynium stereo headphones & 4 sets of silicon ear tips. The standard 3.5mm jack size will allow you to try out our whole range of waterproof headphones at Swimmer Ltd. This flexibility should allow you to find the perfect fit for your ears when swimming. The UWaterK8 weighs just one ounce (25 grams) and has random, normal and playback modes and the system is compliant with Windows 7 & 8, XP, 2000, Vista, iTunes, MAC 9.0 & Higher. -- Memory: 8GB (2000 - 2400 Songs/20 Audio Books). -- Play Time: Continuous 6-8 HRS MP3, 8HRS FM. -- Built-in High Performance Li-Ion Rechargeable Battery. -- Waterproof Neodynium Stereo Headphones. -- High Resolution OLED Display Adjustable Backlight. -- 4 Sets of Silicon Ear Tips. -- Mini-Size: Only 0.4"x1.25”x1.75” (0.9x3x4.5cm). -- MP3/ WMA /FM/Audio Books. -- 7 Play Options: Normal / Random / Intro / Repeat etc. -- 7 Sound Options: Natural, Rock, Pop, Classical, Soft etc. -- Digital FM tuning (Manual,Auto, 20 Stations Store/Recall). -- Single Port Copper Plated 3.5mm Audio/USB Jack. -- System Compliant: Win 7/XP/2000/Vista/MAC 9.0. -- Easy Downloading From iTunes Library. -- USB High Speed Interface. -- IPX8 Waterproof Certification (10Ft/3M). -- 20" Waterproof Neodynium Stereo Headphones. -- USB Cable (Charge, Data).